Ryder Cup vice-captain Sam Torrance has criticised Sir Nick Faldo after he labelled Sergio Garcia "useless" shortly before this year's tournament. Torrance, 61, condemned 57-year-old Faldo's comments in an interview with golf magazine Bunkered. 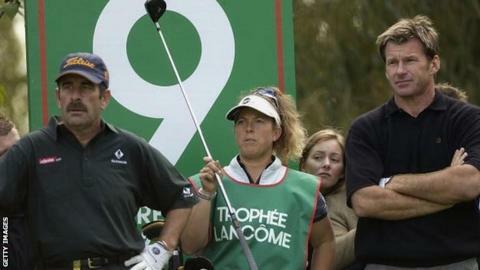 Faldo led Europe to defeat in the 2008 Ryder Cup and felt Garcia had shown a "bad attitude" in that event. "To say that right in the middle of the Ryder Cup. What was he thinking? It was pathetic from Faldo," said Torrance. Faldo subsequently softened his stance, while Spaniard Garcia, 34, said he was willing to "forgive and forget". But Torrance remains exasperated by Faldo's comments during the tournament at Gleneagles, which Europe won against the United States by 16½ to 11½. He added: "It was beyond belief that one of our greatest ever players would come out with a comment like that. Garcia's not a team player? Have a look in the mirror, pal. "Garcia's one of the best team players we have. He's an incredible kid, with the heart of a lion and he's incredible in the team room. "Really, I've just no idea where those comments came from." Torrance captained Europe to victory at the 2002 Ryder Cup and served as vice-captain to Paul McGinley during this year's tournament.